Summaries of Ss Cyril and Methodius, Missionaries. Cyril: A monk who was born about 826 in Thessalonica (Greece); died at Rome in 869. Methodius (his brother) : Born about 815; died in Velehrad (Czech Republic) in 885. With papal approval they preached the gospel in Moravia using their own translations of the Scriptures and the liturgy in the local language. These translations into Slavonic were based on an alphabet they invented, now called Cyrillic. The success of their preaching aroused jealous Frankish opposition. Honoured as apostles of the Slavic peoples, for their contribution to Slavic culture, their missionary inculturation of the Christian faith, and for establishing links between East and West. Fr John Murray PP tells the story of the two Greek monks who became evangelisers of the Slavic people and how Pope John Paul II made them co-patrons of Europe with St Benedict. From the very beginning of his pontificate, Pope John Paul II frequently spoke of Europe as ‘breathing with two lungs’. In that first decade from his election in 1978, Europe was still divided and people in the west had forgotten about the countries behind the ‘Iron Curtain’ as belonging to Europe. Saint Benedict’s place as patron of Europe was never in question. So it must have given the Pope, the ‘man from a far country’, great pride to declare two co-patrons of Europe on 31 December 1980. Tradition tells us that the two brothers, Methodius and Constantine (he did not take the name Cyril until just before his death), grew up in Thessaloniki (Greece) as sons of a prominent Christian family. We know that Constantine was born in 827. Both were highly intelligent men and while Methodius became an important civil official, his brother became a scholar and professor in the great city of Constantinople. Because many Slays came to live in their area of Greece, the brothers had become proficient in the Slavic languages. Their first missionary journey was into Ukraine. Later Rastislav, a prince in Moravia (modern-day Czech Republic), invited them into his territory. The motive was not entirely spiritual; the prince was struggling for independence from German influence. He felt that Christian missionaries from the east, replacing the German missionaries, would help him to consolidate power in his own country, especially if they spoke the Slavonic language. Before they even left on their mission, Constantine constructed a script for Slavonic, a script which became the basis of the Cyrillic alphabet named after him. The brothers were keen to help and were firm believers in translating the liturgy into the local language, whereas the custom in the west was to use Greek or Latin (as it was until Vatican II). When the brothers appealed to Rome – in the issue of having some Slavic candidates ordained for the priesthood – , the Pope – with his own reasons too – approved the use of Slavonic in services and ordained the men Methodius and Constantine had forwarded. The brothers also translated the New Testament and the Psalms into the Slavonic language. Sadly, Constantine would never return to Moravia, and he died in Rome where he had assumed the monastic habit and taken on the name by which history remembers him. There is also an Irish slant to Cyril’s story. Cyril had laboured hard during his lifetime to return the relics of Saint Clement (the fourth bishop of Rome) to the city and this he did in 867. The martyred Pope was interred in the church of his name on the street which runs from the Colosseum to St. John Lateran Basilica. Cyril died not long afterwards (14 February 869) and was buried also in the same church. 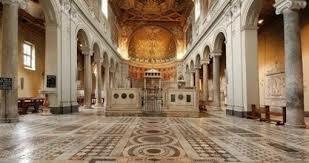 San Clemente Basilica in Rome holds the tombs of Ss Cyril and Methodius in an underground Basilica. Ironically the tomb of Cyril was somehow ‘lost’ when the 12th century basilica was later built on top of the 4th century one. It wasn’t until Fr. Joseph Mullooly, the Irish Dominican prior of St. Clement’s, did some excavations in 1868-70 that the tomb of the Slav saint – as well as the 4th century church and 1st century buildings – was rediscovered. In 2007 the Irish Post Office honoured Fr. Mullooly, featuring him on a number of stamps. Methodius continued to spread the gospel to other regions of Eastern Europe and seminaries were founded in Bulgaria and what is modern-day Belarus and Ukraine. Methodius himself was ordained as archbishop of Pannonia (modern Hungary) and became Papal legate for the Slavic peoples. However his life was not without difficulty, even to the point of spending two years in prison, only being set free by the personal intervention of Pope John VII. The work of inculcating the scriptures and the liturgy into the language of the people he served was continually being regarded with suspicion. In latter years he also translated further books of the Bible into the languages he and his brother loved so much. In his encyclical, Slavorum Apostoli (‘the Apostles of the Slavs’, June 1985) Pope John Paul II spoke of the brothers as ideal examples of the true missionary spirit – faithful to the traditions which had formed them and yet endeavouring to understand the peoples to whom they were sent. They had endeavoured successfully to create an alphabet and a literature for the languages which they encountered. Yet constantly they submitted their work to the judgement of the Apostolic See which they saw as the visible sign of the Church’s unity. The prayer of Jesus, ‘that they may be one’, was indeed their motto. 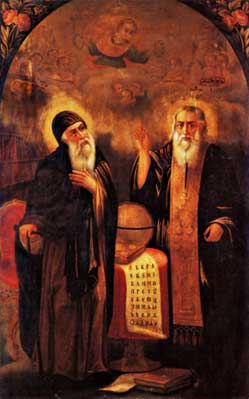 The feast of Cyril and Methodius, co-patrons of Europe with Benedict, is celebrated each year on 14 February. This article first appeared in The Messenger (February 2008), a publication of the Irish Jesuits.